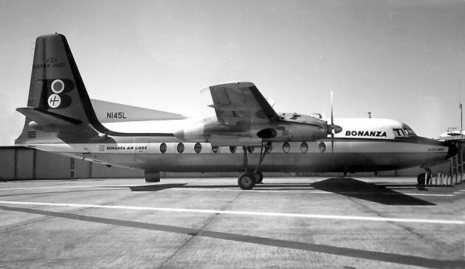 Bonanza Air Lines Flight 114 was a Fairchild F-27 turboprop airliner flying out of Phoenix, Arizona to McCarran International Airport in Las Vegas, Nevada, on the evening of November 15, 1964. At 8:25 p.m., during a landing approach in poor weather conditions, it crashed into the top of a hill in open desert country about 10 miles (16 km) SSW of Las Vegas. All 29 aboard -- 26 passengers and a crew of three -- died instantly when the plane exploded on impact, no more than 10 feet (3 m) below a ridge crest. Although this was not the only incident involving a Bonanza Air Lines airplane, it is the only crash with fatalities during the airline's 23-year history. Wreckage of an airliner that hit a mountain peak in a storm last night was found this morning. Sheriff's deputies said all 28 persons aboard were dead. The propjet Bonanza Airlines plane vanished during a snowstorm just before it was due to land on a flight from Phoenix. Searchers spotted the wreckage shortly after dawn. Weather was poor near Las Vegas with indefinite ceiling at 500 feet, sky obscured, 900m visibility and light snow. Flight 114 was flying a VOR/DME-3 approach when the plane descended below altitude minima. At 9.7 DME, at an elevation of 3575 feet msl the plane struck rising terrain and crashed. The flight should have been at 4300 feet msl at that point. It appeared that the VOR/DME-3 approach procedure was relatively new, having become effective on October 3, 1964. Until November 15 no approaches using this procedure had been flown. The approach chart depiction for the segment of the approach from the 15 mile fix to the 6 mile fix displayed no descent information on the profile section. However, the profile did show a solid horizontal line between the 6 mile fix and the 3 mile fix, with an altitude of 3,100 feet. Further, the solid line was defined in the Chart Legend as "Flight Path," which implied that a descent to 3,100 feet was proper once the fix to which the flight has been cleared is reached. On evening of November 15, 1964, while inboard from Phoenix, Arizona. 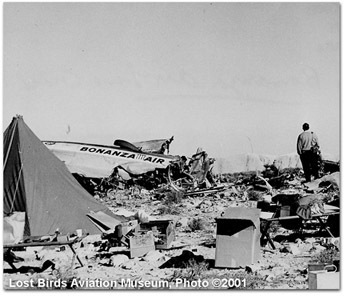 Bonanza Air Lines Flight 114 struck a mountain southwest of Las Vegas, Nevada while attempting to land at McCarran International Airport killing all 26 passengers and a crew of three.